If you buy tickets for a concert, festival, football, theme park or other event – you generally don’t think about what will happen if you can’t go. So under what circumstances are you entitled to a refund? When you buy tickets for an event, what are you actually purchasing? The ticket is obviously part of it, but it’s representative as to what you are buying. The real monetary worth is in the experience. When you buy tickets for ‘leisure’ purposes over the phone, by email, or on the internet, these purchases are not covered by the distance selling regulations. This means that you do not have an automatic right to change your mind and ask for a refund for the tickets. If you’re buying from a private seller, make sure you have a note of their details and remember you have limited rights if anything goes wrong. If the seller sells you tickets for the wrong event, the wrong venue or the wrong date (in other words, the tickets are not ‘as described’) you should be entitled to get your money back. But remember you have to be able to get in contact with them first! The provisions of the Supply of Goods And Services Act 1982 require someone supplying a service to carry it out with reasonable skill – so if your tickets do not arrive in time, you should be entitled to a full refund or compensation for the cost of having to buy replacement tickets. If you buy tickets for an event that gets cancelled, you are entitled to a refund. Often, if for example a concert is rescheduled, the organisers will write to you and offer you tickets for the alternative date. If you are unable to go, you should request a full refund. Often, when you ask for a refund for tickets – in the event of cancellation, or because you cannot attend on the rescheduled date - the organiser or venue’s ticket office will retain the booking fee, citing administrative costs. They will argue that it is to cover postage of the tickets to you, keeping you informed of any changes to the schedule etc. At this point, it’s worth checking to see whether the ticket seller is a member of STAR (Society of Ticket Agents & Retailers). If they are a STAR member they cannot keep your booking fee. Unfortunately, if they are not members they can keep hold of your fee. It’s still worth asking for a full refund in any event. If you go to an event and your seats weren’t as described, for example you had restricted view seats when you were told you were in the front row, this is in fact a breach of contract. You may be able to claim compensation for ‘loss of enjoyment’ although this can be difficult to quantify. 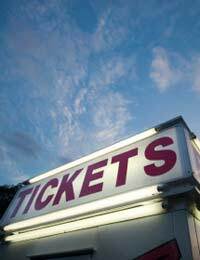 If a business sells you tickets that aren’t described accurately, report them to trading standards. The best way to protect yourself is to do your research into who you’re buying from before you part with your cash: Check to see whether the business you’re buying from is a member of STAR, and make sure you’ve read their terms and conditions of sale. Make sure you have written down the details of a private seller, in case you experience any problems.